One of the more successful WordPress plugins we use is Broken Link Checker. It is obvious from the name that it checks for broken links, but let’s dive a little bit deeper to see what that means. When links don’t work, we say they are ‘broken.’ Broken links affect search engine optimization (SEO). Dead links mean that search engines (Google, Bing, Yahoo…) can’t index that content. Think of them as the classic ‘bait-and-switch’ trick, where the linked text promises one thing, but then delivers nothing. And when people see web pages that have broken links, their confidence in the other content of those pages is shaken. Not all broken links are your fault. Trusted sites sometimes disappear or rearrange their articles. Content that was important at one time sometimes gets removed when it becomes dated. These causes are beyond your control, but the broken links still reflects poorly on your site. 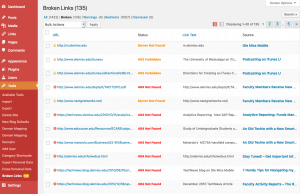 To help you maintain your WordPress sites, we have the Broken Link Checker plugin. We’ve activated it for many sites already, but if you don’t find its reports (in the dashboard under Tools / Broken Links) then you should be able to activate it in the Plugins section. (If you can’t, send email to webmaster@olemiss.edu and I’ll get it activated for you.) Once it is active, you can begin taking charge of all your broken links. In the interest of full disclosure, here’s a screenshot for the report for the TechNews site. Go ahead and click the image and see that we currently have 135 broken links. Some of those are links to other posts we had written but deleted. Others are links to other sites on the web that are no longer there. Hover over the title in the Source column and select Preview to see the page as your visitors see it. You’ll notice the broken link text will be indicated with strikethrough marks, which is a warning to users that the link is bad. Edit the page where each broken link was identified. Sometimes you can tell that a simple typo was the cause of the problem, so fix those. The cause may not be so clear for others. If, like on the TechNews site, some of the links are just old, then consider unlinking their text and rewording the surrounding text so that it doesn’t reference the link. 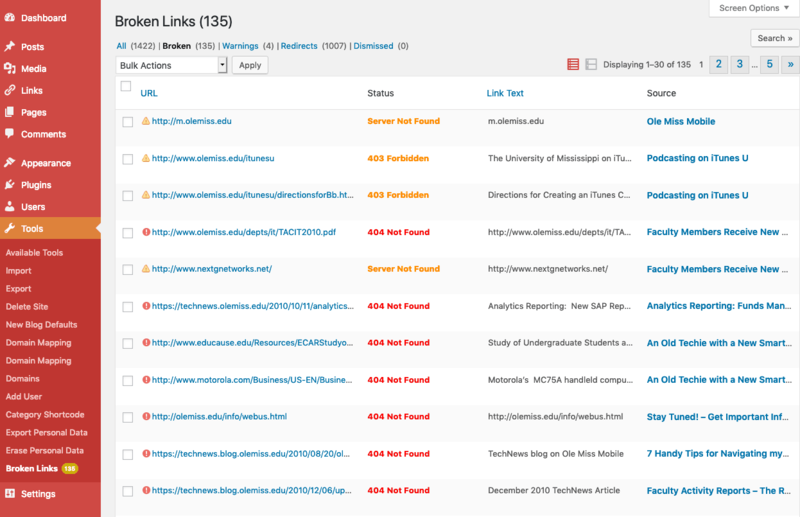 Some links aren’t actually broken, but they were temporarily unavailable at the time the report was generated. If you can follow the link and can verify that it does work, hover over the error and see the options to Dismiss, Recheck, or mark as Not Broken. If you’d like help, write me at the email address above and let me know where you’re having trouble. The goal is to have zero broken links reported on all of our sites. Now let me get to work cleaning these up in TechNews.